Ever wonder how to mix your own custom ink colors?! 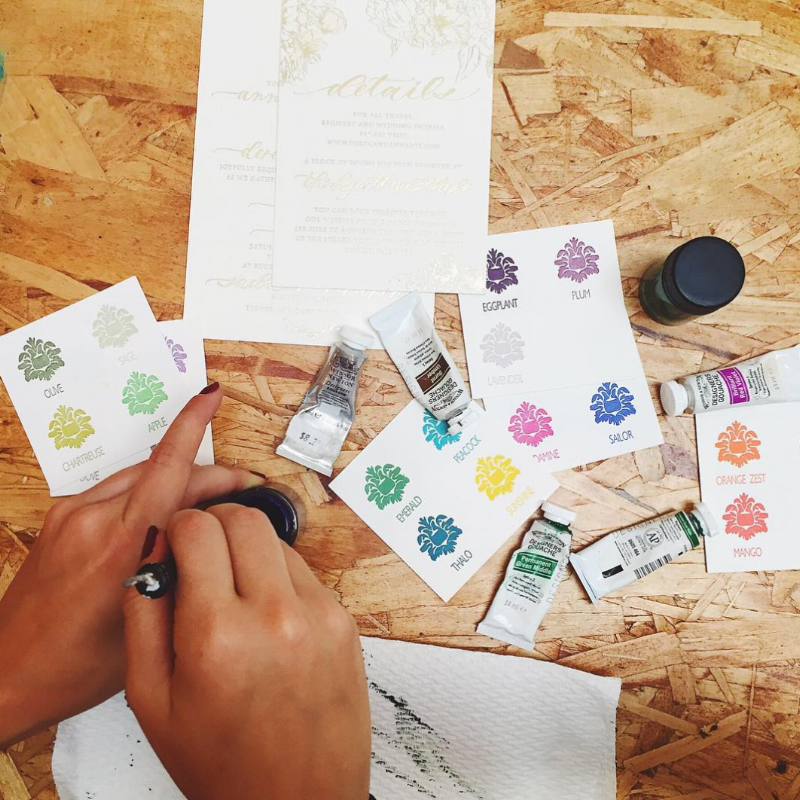 Maybe you were commissioned for an envelope addressing job for a bride, a custom calligraphy quote, or just curious about color matching for your own enjoyment...Well, we go your back! Read through the steps to see our entire process and you'll be mixing up custom colors in no time! When creating a custom colored ink, our go-to is Winsor & Newton gouache mixed with water to create any color imaginable! Some calligraphers also use Gum Arabic, which is a binding agent, to prevent the pigment and water from separating, but we keep it simple over here. Just a couple shakes here and there and the color is mixed! When you mix your first couple inks, it may be a little trickier to get the right consistency at first, but once you get the hang of it, it's definitely worth it to achieve a beautiful pigment that you and your potential clients will LOVE! Winsor & Newton Gouache - Nothing compares to quality materials! Everything we do over here at Mon Voir is done with the highest quality supplies. Jenna has been using this brand for years and whether it's for watercolor or calligraphy ink, we use Designer/Proffessional level only! It may cost a little more up front, but TRUST US, you will be much more pleased with the results. You can find Winsor & Newton at your local art supply store, Amazon, or Blick! Small Container/Jar - We recommend a 1.5 oz jar to allow for a good amount of ink that will last you a while. You can find sets of jars for a reasonable price on Amazon! Calligraphy Pen - We'll typically use the end of a calligraphy pen (NOT the nib) to stir the mixture. Then flip it around to test out the ink with a few basic strokes. If you're curious about allllll our preferred materials when it comes to calligraphy, check out this blog post! Eye Dropper - This allows you to add a few drops at a time until you get the correct ratio of water to gouache! Again, you can find one of these on the always trusty Amazon. Distilled water - Helps prevent the possibility of mold growth if you will be storing the ink. STEP 1: You’ll squeeze out an amount of gouache that’s appropriate for your project. For a big project, like calligraphing envelopes, you should mix up a lot of gouache (we typically use about 1/2 of a 14 ml tube). STEP 2: Using your eye dropper, add about 3/4 distilled water to 1/4 gouache. STEP 3: Mix the water and gouache together with the end of your pen or paint brush. Continue to add water and/or gouache as needed until you get a mixture that is similar to the consistency of heavy cream. STEP 4: Test out your mixture by dipping your calligraphy pen and practicing 3-4 basic strokes. If you notice your strokes seem a little thick or your nib is not releasing enough ink, try adding a few more drops of water. If your strokes are bubbly and translucent, try adding a bit more gouache! And that's it!! You can use this method to match a specific ink color to printed material, envelope colors, and MORE with a Pantone Matching System (pictured in the photo above on the right). It's a designer's dream being as customizable as possible with colors, so get on it! !